Laser tag – who doesn’t enjoy a good game of this at some point? Laser tag has been a form of recreation for a significant number of years, enjoyed by those both young and old. With the growing trend of laser tag, more and more manufacturers have recently come to light in the last decade or so, developing laser tag guns that are pretty impressive. Naturally, ever manufacturer believes that their particular laser gun is the best for various reasons, which can be incredibly overwhelming to those who are not exactly sure of what it is that they are looking for (and with some of these laser guns being a little rough on the wallet, it is best to know what it is that you are possibly buying) so with this being the case, we at ReviewCart have outlined several of the best-rated laser tag guns that have been reviewed thus far in 2018. The Lazertag multiplayer battle system does rank in as being one of the most expensive laser-tag guns on the market currently, coming in at $799.00 on Amazon. With the Lazertag multiplayer system, you can either be tagged or tag fellow players in an incredibly realistic player experience. The multiplayer system does allow “combat” with two or more players, but keep in mind that additional taggers have to be purchased separately; if you prefer to experience a single-player mode, this option is also available, with accompanying video-game attachments. 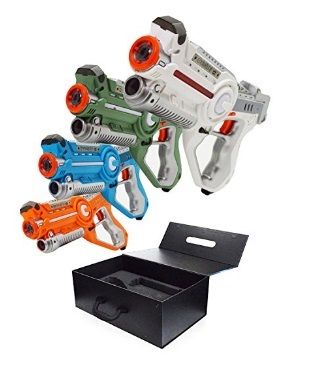 There are an impressive number of upgrades that come with this particular lazertag gun (and yes, there is a difference between “lazer” and “laser”; this form of multiplayer system is a specific brand from Hasbro, just as an FYI for those who may not be familiar with what they are looking for. There is an app that comes with this lazer gun as well that makes both the gun and app work together incredibly well. Initially, the price of the Lazertag multiplayer battle system is a most definite con, however, potential buyers can possibly find a cheaper option on the market, although there is a good chance that the systems will be used. Also, if users do decide to use the app, as of now, the app is not compatible with Android devices, so that is something that also has to be kept in mind. The Dynasty Toys Laser set for kids (comes in a 2-pack) comes equipped with a built-in target meaning that there is no need for a vest during play! There are also two settings (team and blast) that are interchangeable and get be programmed on the go so no need to interrupt your game for an extended period of time and experience that unnecessary inconvenience. 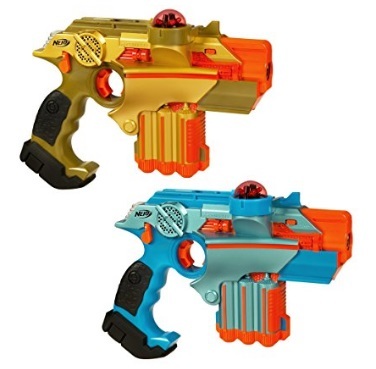 Each blaster weighs a little less than two pounds apiece and has their own weaknesses and strengths, all in relation to the amount of damage that they can take, as well as how long they take to reload. Let’s take a look at the additional pros and cons below. Bells and whistles are amazing on this thing, even compared to the Nerf guns that are currently on the market. Users have the options to change between various sounds effects (missiles, shotgun, etc.). 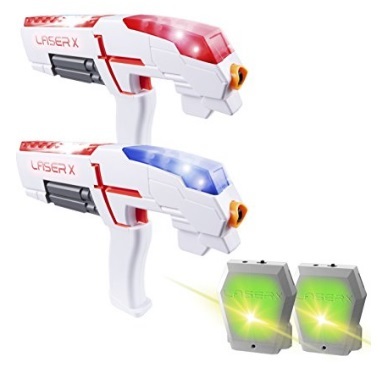 These laser guns are incredibly awesome, especially for their price ($50.00 for a pair on Amazon). On the negative side, there have been reviews that the guns, upon delivery, have had technical difficulties, or not worked at all, however, this may simply depend on where the item is purchased from. Users of the Laser X 88016 can blast their opponents away with little trouble, with the receiver vest that comes with the Laser X 88016 being able to get blasted from up to 200 feet away (which can be a double-edged sword depending on your skill). The Laser X also comes with full-color lighting effects that allow you to keep track of both your shots and hits. This particular gaming set also comes with an interactive voice coach that gives tips and even feedback during your game. Users also have the option to plug in their headphones and listen to the Laser X soundtrack (yes, it comes with a soundtrack) and the various sound effects that accompany the set. The Laser X is also compatible with all other Laser X sets, meaning that you can either play as teams or as individuals, depending on your preference. The option for single-game play allows users to play games however they sit, whether it is multiple players or a single free for all. Users also have the option of using headphones or not with this gaming set- the only difference is that if you do use headphones, the music just comes through the speakers that are built into the gun. The cons of the Laser X 88016 can vary slightly- anything from the constant beeping that occurs during gameplay or the batteries running out after playing only briefly. There have also been reports that the firing distance is not as far as advertised (50 feet). The nerf Lazer Tag Phoenix comes with a complete, two-player system that lets users battle in an intense “real-life” laser combat game that features two Phoenix LTX taggers for both fun and action-packed competition with friends. Those who play can register their hits with lights, sounds, and vibrations (which can add a level of excitement to any game). 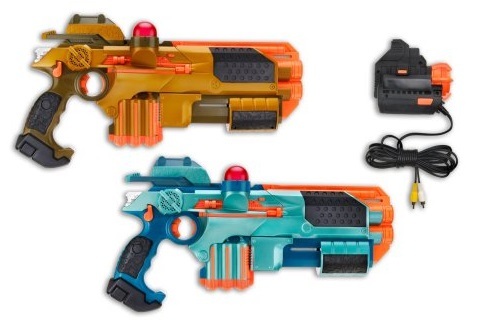 The Nerf Tag Phoenix also includes two Phoenix LTX taggers, which requires 12 “AA” batteries that aren’t included and the Phoenix LTX taggers use a class one LED, infrared light that is approximately 40 nanometers in wavelength. The Lazer Tag Phoenix guns are incredibly sturdy and provide a ton of gameplay time for users both young and old. The guns can also be set for either 10 or 25 lives, providing a “cushion” if you are playing against younger individuals. For this con section, we will call the two guns that come with the Lazer Tag Phoenix, A, and B; gun B will get “hit” no matter where gun A is in reference to gun B. Naturally, this can become incredibly irritating during gameplay. Also, the triggers can sometimes get stuck which can also get in the way of some plain ol’ fun. The last laser tag gun that we will take a look at is the Dynasty Tag Set and Carrying Case (not to be confused with the previous Dynasty set that was reviewed previously). The four-pack Dynasty Tag Set comes with four different settings that can be changed depending on your game style, meaning that you can play on the same team or in a free-for-all battle. Players can choose between several teams, in addition to the blaster is the target, meaning players do not need to wear a vest. Both the blast settings and team settings are interchangeable on each blaster and can be set on the go for the convenience of players. There have been reviews of the guns randomly not working only after a few times of play and the guns being delivered damaged or dinged. There have also been reports of extremely poor packaging, depending on where, exactly, buyers purchase this model from. 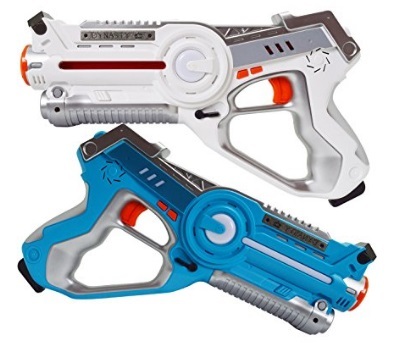 Overall, the general consensus depends on where you are purchasing your laser guns, or taggers, from; the main (negative) issue seems to be that the guns either get delivered damaged to buyers, stops working after a short period of time or both. Unfortunately, this can be the case with a lot of things that we buy, no matter what industry the products are a part of; the best recommendation that can be made is to determine what it is that you are looking for and how much you want to spend. If the price is not an option, then it may be worth spending those few extra bucks on the more fancy options, as opposed to trying to save a few dollars and having your purchase stop working after a couple days. Also, keep in mind that this is only the tip of the iceberg in regards to what is available out there so be sure to take the time to do your research accordingly!